July 6, 11.59 am. Town Hall Square, Pamplona. A living sea of red and white, framed by the colourful façades of the square’s three-storey buildings, sways from left to right chanting “Viva San Fermin” and other mostly undecipherable interjections. Balloons and giant balls bounce over the crowd. Whistles. Confetti. Flags. Drum rolls. And finally, at 12.00 pm sharp, a “Viva San Fermín, Gora San Fermín” from the balcony of Pamplona’s town hall and a rocket whooshing into the sky – El Chupinazo -, mark the start of 204 hours of non-stop partying. You can live it all at ground level, be overwhelmed by the masses of charming but slightly rowdy party-goers and have a very limited view of the event… Or, you have the choice to experience it from the comfort of a balcony and get a global perspective of the innumerable details at play in Plaza del Castillo at all times. There’s absolutely nothing wrong with living El Chupinazo from the ground. You’ll feel the pulse of the festival, you’ll be part of the rhythm of the crowd and… you’ll probably will not be able to see anything past the person in front of you. Which one is it going to be, then? Ground level? Or a balcony with an unforgettable view over Town Hall Square and an intimate group of San Fermín lovers calmly enjoying the experience together? A collection of pictures of the happy revellers right in front of you or perfect panoramic images and videos of the crowd and the square that once was Hemingway’s favorite playground? If you’d rather go with the second option, talk to us. We’d love to share one of the most memorable moments in Pamplona with you. 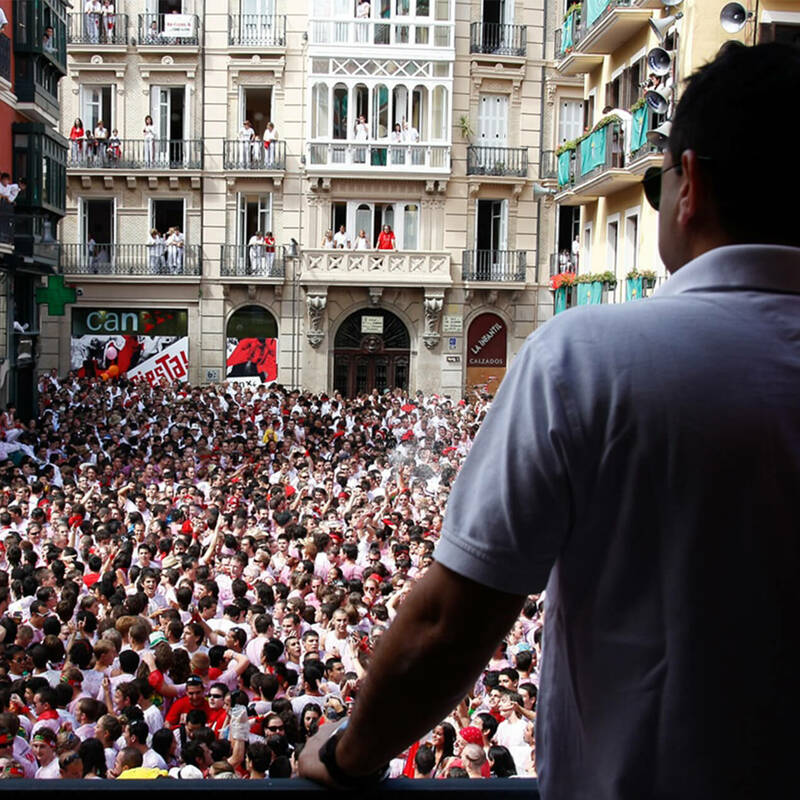 Last year we had the opportunity of enjoying San Fermin’s Opening ceremony from one of Francisco´s balconies. It was just what we needed! The balcony was located on a first floor apartment and it was very large, so much so that there was plenty of room to accommodate the 12 people who were there. The directions to the apartment were very clear and we had no problem finding the place. By the time we arrived (around 10:30am) there was already a lot of people in the square. Elo, Fran´s colleague, was waiting for us. She showed us the apartment, made us feel welcome, and invited us to a drink. From that moment on, it was all fun and games! There were other guests at the apartment from all over the word – some from the USA, others from Spain and a couple from Taiwan, who has visited us in Rome this past fall! We enjoyed a nice brunch with local cheese, Spanish ham, and the best homemade Potato omelet in the world! We washed it all down with beer, red wine and sodas. It was the best possible start of the party we could have ever asked for!!!!! 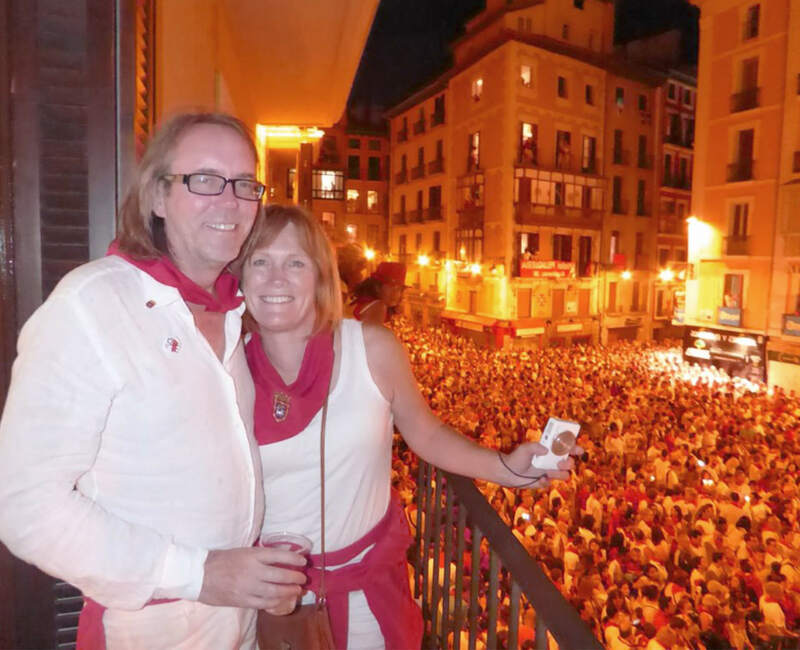 Why rent a balcony from Pamplona Fiesta during San Fermin’s Opening Ceremony? We have a large number of balconies available ideally located in strategic vantage points of the square. 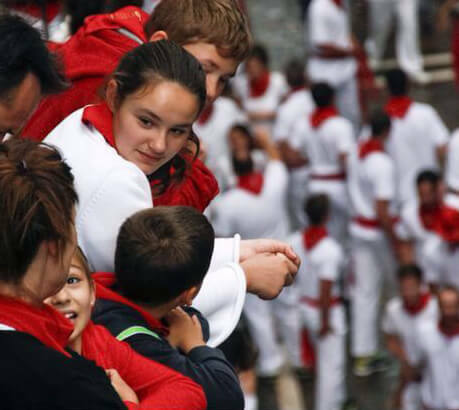 We are locals (or expats who have lived in Pamplona for more than 15 years) with an extensive knowledge of the different events that take place during the bull run festival. Our apartments are modern, well-presented and extremely clean. You’ll receive a sumptuous Spanish-style brunch spread before noon. You will be minimizing the potential risks involved in participating in crowded events. There is nothing quite like El Chupinazo anywhere in the world. Hemingway was fascinated by it. Millions have been hypnotized by the crowds collectively bobbing and chanting. And now you too, can feel the unique vibe of this experience and record it for posterity with all the glory it deserves. “¡Viva San Fermín! ¡Gora San Fermín!… ¡Pobre de mí, pobre de mí, que se han acabado las fiestas de San Fermín!” “Poor me, poor me, for the fiesta of San Fermín has come to a close” Miserable, we remove our red neckties, blow all our candles off at midnight, and come to terms with the fact that San Fermin is over and we have to face reality again. And you need to see it. You need to feel San Fermin’s heart slowing down. You need to experience this spectacle of colour, sound and soul from the best possible vantage points in Pamplona. Live this scintillating, spine-tingling event from the comfort of a strategically located balcony with sweeping views of Town Hall Square. Rent a Balcony in Pamplona and share El Pobre de Mí with us. You will feel the heart and soul of Pamplona slowly coming to terms with the end of week-long festivities accompanied by knowledgeable guides who’ll explain every detail of the ceremony. You’ll enjoy the spectacular event from one of our many balconies, ideally located in strategic vantage points of the square. We will maintain our lines of communication constantly open to ensure you and your family and friends live a memorable experience that matches your expectations. I’m originally from Pamplona but I have been working in London for the last 18 years. This year I invited some of my best friends to join me during the Festival of San Fermín. I rented a private balcony in front of the city hall for the five of us. I asked Fran about the possibility of booking a place exclusively for us and he went all out of his way to find and apartment and a balcony just for us to share with the owners. It really was like being at home! This family welcome us as though we were their brothers and sisters! It was sooooo much fun!! The view of the city hall it was incredible! Our balcony was located at the back of the square so we had a great view of the people in the street. Plus, the balcony was just at eye level with the balcony where they light up the rocket. It was incredible!!! Bid San Fermin farewell with us from one of our exclusive balconies and experience the collective sadness of a town that refuses to let go. Rent a Balcony in Pamplona now and share our “sorrow”. Book it here.